Ok so by now you know Black and White is my absolute favorite color combination, so I won’t bore you by telling you how much I love it. But let’s talk about black and white during the spring. This season is most popular for bright lively colors like neon and pastels, but because black and white is such a simplistic combination it works for any season. During the warm months I like to stick to easy breezy lightweight materials that keep you cool. These jersey pants have a loose fit making them perfect of the warm weather. I love the bold white stipe, it adds the perfect contrast. 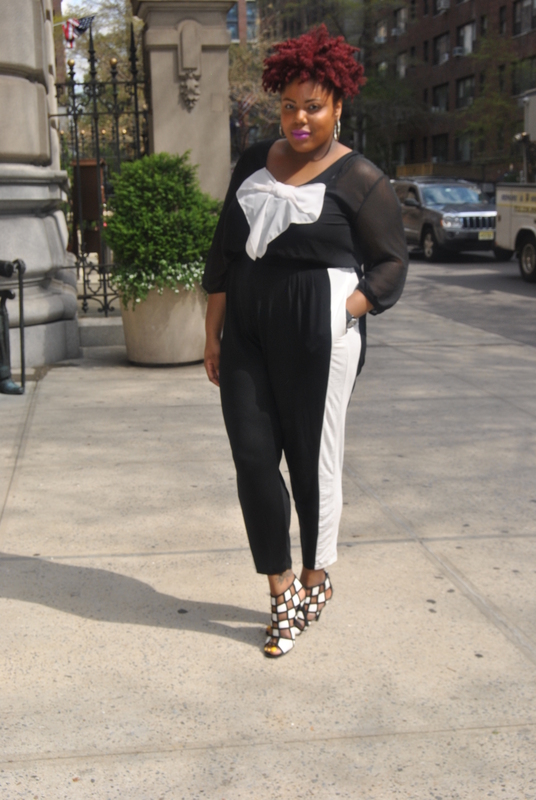 I paired the trousers with a chic black sheer blouse with an adorable bow time embellishment. The material and texture composition of these pieces are what makes them the perfect black and white spring pieces! I absolutely love these shoes! They are extremely comfortable, and the box print makes them an “oh so stylish” addition to this black and white ensemble! Love your plucky style. The shoes are fabulous. ahhhhh Tricey!!!! thanks so much!